Currently Reading, etc. – my books. my life. I normally have a pretty good work schedule – especially for a lawyer. I basically work from 8:30 – 5:30 or so with the occasional work taken home. This week was different. I basically worked every single moment I was awake. I’m not complaining – when there is work to be done, I’ll do it. But it explains why I haven’t had any time for reading and why I didn’t post about books all week. I also haven’t been reading blogs – or email for that matter. I’m afraid to check google reader. That is part of my plan for the weekend. My solution: to tell you all what I’m currently reading (and for fun what I’m listening to and watching). 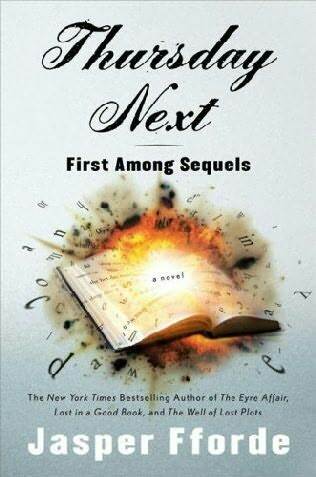 Thursday Next: First Among Sequels by Jasper Fforde – I have about 120 pages or so left, so I hope to finish it this weekend. I’m more into it than I was at the beginning and it reads quickly (I also skimmed ahead and saw that there were some pages of pictures only). Pride and Prejudice by Jane Austen – I have been reading this forever. Or not reading it. I love P&P but as I’ve said before, I’m just not into it this time. So I downloaded the audio version from LibriVox and I’m listening to it in the car (I figured out how the bluetooth audio in my car works and it is amazing!). So I am slowly getting through it now. All Quiet on the Western Front by Erich Maria Remarque – I started this for RBC. At first I wasn’t going to participate because I had no desire to read this book, but I owned it and I figured I might as well get to it now while others are reading it. I do think it’s probably a book I should read at some point. And some other books that I’ve only read a chapter or two in so I don’t really count them. Dawson’s Creek – I watch this in the morning while I’m getting ready for work since I can’t stand the news and I’ve watched all the TBS episodes of Saved by the Bell 8000 times. I’m almost done with Season 4 and still enjoying it. It’s been a few years since I’ve re-watched this so it was about time. Prior to Gilmore Girls, it was my all-time favorite show and it just takes me back to high school whenever I watch it. Glee Soundtrack – It’s fantastic. Need I say more? Wintersong by Sarah McLachlan – I know it’s early, but I feel like I didn’t get to start the Christmas season until December 20th last year, so I’m making up for it this year. And I’m basically just listening to Song for a Winter’s Night on repeat, not the whole album. I think I have Thursday Next on my bookshelves. I’m hoping to get to it one day. You’re actually going to go through your Google Reader this weekend? Scary! I didn’t check it at all last weekend so when I saw how many unread posts I had, I just marked them all read. Have a great weekend. I plan on skimming them and then marking as read. 🙂 I like fresh starts. Hope you enjoy listening to the audiobook version of ‘Pride and Prejudice’. I read it again earlier this year and liked it but related to it in a different way than I did before. I could appreciate it better now. I loved ‘All Quiet on the Western Front’ when I read it a few years back. I saw the movie version too. Looking forward to reading your thoughts about it.